If you're a glass half empty kind of person who normally fears the worst, then Northern Ireland's Euro 2020 qualifying campaign could see you break out in a cold sweat in the early morning hours. 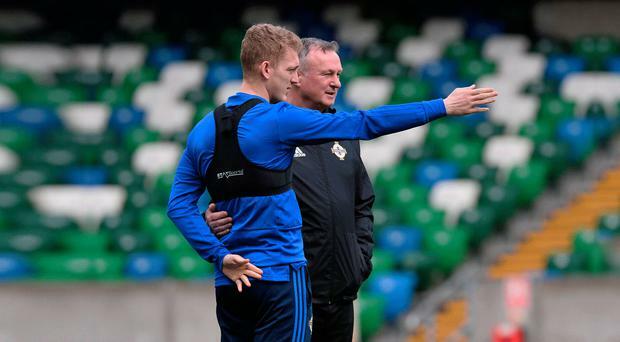 There's a positive or negative way to look at things, and those with a bleaker outlook may be tempted to swiftly dismiss the qualification hopes of Michael O'Neill's side. Of course, there's always optimism at the start of a new campaign, and home games against Estonia tonight and Belarus on Sunday in Group C provide a great opportunity to gain fresh momentum for tougher challenges ahead. But there's always some concern mixed in with the excitement. Firstly, Northern Ireland were handed the dreaded group of death with Germany - yes, that lot again - and Netherlands providing fierce opposition. Secondly, too many players in O'Neill's squad aren't playing regularly enough for their clubs and thirdly, recent results in competitive qualifiers, while perhaps undeserved, do not inspire confidence. But that's the negative picture painted. Take a more positive approach and you'll accept that Northern Ireland's last two qualifying campaigns left us with a hell of a lot to be proud of. The Euro 2016 adventure, all the way to the last-16, was an unforgettable thrill ride, and as heartbreaking as the World Cup play-off defeat to Switzerland was, it can't mask what was another outstanding effort from O'Neill and his men. So the players have delivered when it mattered before, and perhaps they feel they have a point to prove after that play-off nightmare and a Nations League campaign which brought a fair amount of frustration. Whether Northern Ireland can progress out of a qualifying group which includes Germany and Netherlands we will discover this year, but it would be great to once again look back with pride when the final whistle sounds in Frankfurt on November 19. Of course, O'Neill will have concerns, but it's part of his job to instil belief into the players and his record speaks for itself. So, just how positive is he? "We've had 20 qualifying games in the last four years and a win percentage of 60 per cent," he argued in his pre-match press conference at Windsor Park yesterday. "We've lost only one home game in that period if you take the Switzerland play-off out of it. There are a lot of positives to look at. "The only home game we've lost is Germany, and I don't think there's any shame in that. "We've become a team that knows how to get results. There is an evolution in the team with the younger players coming through. "When I look at this team against the other teams, we have more legs and running power than at any time in the past. "That allows us to play with a higher intensity, and that's how we intend to approach the games. For me, it's all positive. I don't think there's any value in dwelling on the Nations League. "We could have had a fantastic Nations League and we would still be in a group with Germany and Holland. The group wouldn't change because of the Nations League. "If you look at where we've come as a team, we're a far more possession-based team than we were in previous campaigns. That's how we want to approach the games going forward. I'm looking forward to it and I sense that in the players." You can always rely on a little injury news to dampen the mood. Sunderland striker Will Grigg has been ruled out of both games with an ankle injury. Defender Gareth McAuley, midfielder Corry Evans (both hamstring) and winger Gavin Whyte (thigh) are all injury concerns. But O'Neill is confident he has sufficient talent in his ranks to secure the victories he admits are "essential". "The depth of the squad will be tested," said the former Shamrock Rovers chief. "It's not particularly deep, there's no secret to that, but it gives players opportunities, and to the younger players. I think the younger players we've brought into the squad have freshened things up a bit. "We have 16 players in this squad that were part of France, so there is good experience in the squad and people who have gone through the qualifying campaign and been part of the World Cup where we missed out in the play-offs. "We still have a strong core of experienced players there. "The games this week are essential really, there's no point in saying otherwise. "Look, if you didn't get results you still have games to make up the arrears. But if we're realistic, we have to do everything possible to win the two games. "Our other two games are Germany and Holland, so without being disrespectful to Estonia and Belarus, these are two of our easier games at home. "You would imagine Estonia and Belarus will be tougher games away from home in June as well, so the way the fixtures have come out means these games are essential to give us momentum and an opportunity to put points on the board. "When you're a smaller nation you need to be out in front. It's very difficult to try and come from behind in a qualifying campaign when you're a small nation. "We'll be aiming to do that. The players are under no illusion. "We've looked at the group and talked through the scenarios, but that's all talk at the end of the day. "You can plan and plan, we have to go out and perform. The onus will be on us to perform tomorrow night and set ourselves up for three points and for the second game. "The games in June will be much easier if we've got maximum points out of these two games." O'Neill will be happy if a ball goes into the net off someone's backside in the 89th minute and Northern Ireland win 1-0 tonight. Even the doom merchants may start feeling positive if that happens.